The rise of cohabitation in family process among American young adults and declining rates of marriage among cohabitors are considered by some scholars as evidence for the importance of society-wide ideational shifts propelling recent changes in family. With data on two cohabiting cohorts from the NSFG 1995 and 2006–2010, the current study finds that marriage rates among cohabitors have declined steeply among those with no college degree, resulting in growing educational disparities over time. Moreover, there are no differences in marital intentions by education (or race/ethnicity) among recent cohabitors. 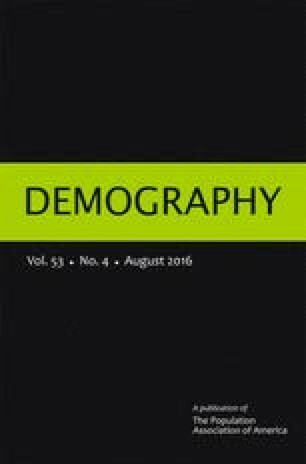 We discuss how findings of this study speak to the changes in the dynamics of social stratification system in the United States and suggest that institutional and material constraints are at least as important as ideational accounts in understanding family change and family behavior of contemporary young adults. An earlier version of this research was previously presented at the 2014 meeting of the Population Association of America. We are grateful for helpful comments and suggestions by participants in the PAA session. This research was supported by grant, 5 R24HD042849, Population Research Center, and 5 T32HD007081, Training Program in Population Studies, awarded to the Population Research Center at the University of Texas at Austin by the Eunice Kennedy Shriver National Institute of Child Health and Human Development (NICHD). Opinions reflect those of the authors and do not necessarily reflect those of the granting agency.